Tag: "Multi Market Study of Critical Information Needs"
WGN to Program WKQX 87.7 Beginning Monday. As tipped by Chicago media writer Robert Feder, Tribune’s WGN will begin an LMA operation of WKQX-LP at 87.7 in Chicago starting Monday, February 17. Feder reports that under terms of the LMA with license holder Venture Technologies Group, the deal commences Monday at 1:02 pm on the 17th, a minute after Cumulus Media drops the alternative rock simulcast with 101.1 FM. President and general manager Jimmy de Castro tells Feder, “We’re outgrowing WGN with great talent. Everything we have said we wanted to do is based on the strength of WGN and our personalities. It’s all about getting the best spoken-word talent and getting more bandwidth.” Vice president of creative content for WGN, Todd Manley, will announce a full lineup soon but mornings will begin with Jonathon Brandmeier who’s been doing a morning program on WGN.fm since last September. Read Feder’s full story here. Phil Hendrie Exits AM/FM Radio. Talk radio host and satirist Phil Hendrie announces he’s leaving the production and syndication of his daily AM/FM radio program after March 14 in order to fully focus on his podcast and other media ventures. He’ll continue doing “The World of Phil Hendrie Show” on TuneIn, iTunes, the Sideshow Network and www.philhendrieshow.com. He says that “Due to the tremendous positive growth this past year owing directly to his fans,” he’s decided that is the area where he should focus all his energies. He adds, “The digital world is where we have made our living the last seven years so as radio attempts to find itself we’ll put our energy in our digital and online product, our animation project, my one man show and of course TV and film opportunities wherever they may occur. To our fans, we haven’t gone anywhere! Our daily show will continue” on digital platforms. Gerry Callahan Remark Irks Dunkin’ Donuts; Company Cancels Ads on WEEI Affiliate Stations. The Boston Globe is reporting that Canton, Massachusetts-based Dunkin’ Donuts has cancelled ad buys on stations in the region airing WEEI, Boston programming after WEEI morning co-host Gerry Callahan made a “disparaging comment,” presumably about the company’s donuts. In the Globe piece, Entercom Boston VP and market manager Phil Zachary says Callahan admits he “screwed up badly” with the off-the-cuff remark and that Zachary understands how Dunkin’ Donuts feels. “You just don’t call somebody’s baby ‘ugly,’ even if it’s unintentional.” Zachary wouldn’t say what Callahan’s words were. He says the ad buy was not a lot of money but that’s not the point. Dunkin’ Donuts has separate ad buys for WEEI, Boston, Callahan’s endorsements and WEEI’s O&O affiliate stations in Providence, Worcester and Springfield. The Boston deal ended in January before Callahan’s comment. Dunkin’ Donuts has been a long-time advertiser with WEEI, especially on Red Sox broadcasts which are ready to resume in a few months. How the incident will affect that remains to be seen. TALKERS to Publish 2014 Heavy Hundred on Monday, March 3. The 2014 installment of one of TALKERS magazine’s most popular and, perhaps, controversial annual features – “The 100 Most Important Radio Talk Show Hosts in America” – is being readied for publication Monday, March 3, 2014. Also known as “The Heavy Hundred” the ranked listing of 100 hosts and talent teams from around the country is based on a number of both quantitative and qualitative criteria and is determined by collective analysis of the TALKERS editorial board. It includes local and national hosts from a variety of genres falling under the umbrella of “general” talk or “news/talk” radio covering politics, health, finance, relationships, consumer tech, popular culture and a variety of specialties. (TALKERS launched a special and separate Heavy Hundred of Sports Talk two years ago.) Hosts on the list are selected from those working at the time of its publication on platforms that include commercial and public AM/FM radio as well as satellite radio (internet-only talk hosts are ranked by TALKERS in an annual feature titled “The Frontier Fifty”). According to TALKERS VP/executive editor Kevin Casey, “It is no secret that economic restraints facing the industry these past few years have contributed to shrinking the number of individuals working on the air across the nation. Although the 2014 edition of the Heavy Hundred will, of course, include many familiar names, the need for new blood, fresh voices and potential up and comers has never been greater. Readers will find this year’s roster will feature a number of new names and first-timers, which is quite exciting!” Companies interested in sponsoring segments of this widely-discussed and read (by hundreds of thousands of broadcasting industry members and consumers/listeners) feature should call 413-565-5413. Radio Mercury Awards Final-Round Judging Panel Announced. Chief judge Matt Eastwood helped assemble the jury for the 23rd annual Radio Mercury Awards. The panel represents radio’s top advertising categories including automotive, communications, financial services, packaged goods, over-the-counter, retail, spirits, and quick-serve restaurants. Final-round judging panel consists of JWT New York group creative director Jill Applebaum; BBDO New York executive creative director Chris Beresford-Hill; Cog NYC founder Wayne Best; Grupo Gallegos chief creative officer Pablo Buffagni; Young & Rubicam Group New York chief creative officer Jim Elliott; DDB Chicago executive vice president/executive creative director Mark Gross; Publicis New York executive creative director Joe Johnson; and Deutsch New York chief creative officer Kerry Keenan. “This list is a ‘who’s who’ of well-established creative executives, and perennial award-winning agencies with a long history of creating exceptional, noteworthy creative executions,” remarks Eastwood, who is chief creative officer of DDB Worldwide Communications Group New York. “More importantly, our panel consists of brilliant thought leaders who have a true love and appreciation for the greatest writer’s medium of all time, radio.” Radio Creative Fund chair – and Radio Advertising Bureau president/CEO Erica Farber – adds, “We feel so incredibly privileged to have gathered such a pinnacle group of creative ambassadors for this year’s competition. The bar has been set high, but I am confident this group will help ensure that the mission of the Radio Mercury Awards lives on as we award the best creative audio commercials over the past year.” Prizes will be handed out in a variety of categories such as “Agency Production,” “Radio Station Produced,” “Student,” “PSA,” “Spanish Language,” and “Best of Show.” Deadline for submissions is April 1, with the awards event taking place June 4 at New York’s Le Poisson Rouge. Southern California Broadcasters Association to Provide Quarterly Guidance Report. Planning and research material is for California advertising agencies, clients and its members. Southern California Broadcasters Association president Thom Callahan notes that, “The SCBA Quarterly Market Guidance Report fulfills a growing need among California ad agencies and clients to look ahead to the next quarter to learn, plan, create, and execute even more effective radio advertising campaigns based on market conditions, trends, and the upcoming quarter’s business environment. As an additional service to the advertising community, the SCBA will encourage face-to-face planning and development meetings with advertising agencies and major clients to provide full-year guidance and customization of our extensive market research.” The QMG report will give current and predictive regional economic data, radio category growth, and commentary on advertising and business trends. The report uses regional economic development corporation reports, member reports on market trends, Miller Kaplan Arase data, and audience measurement data. It will be posted late next month for second quarter 2014 guidance on the SCBA’s website (www.scba.com). S-Class Mercedes-Benz to Have HD Radio. Mercedes-Benz of Mexico is launching its S-Class with HD Radio. iBiquity Digital is the developer of the digital technology and its chief operating officer Jeff Jury states, “We are very pleased to achieve the key goal of North American standardization with Mercedes-Benz. With this expansion, Mercedes-Benz drivers across Canada, Mexico and the United States have access to HD Radio technology in their cars. This coincides with our continuing efforts to bring HD Radio broadcasting to all markets across North America. By offering the technology as standard, Mercedes-Benz is ensuring that all their customers can enjoy the current services and be ensured of enjoying the coming ‘all-digital’ future.” The 2014 S-Class is now at dealerships across the United States and Mexico. More than 2,230 digital stations are on-air; over 1,480 HD2 and HD3 digital-only channels broadcast content that can only be heard with an HD Radio receiver. Odds & Sods. WPEN-FM, Philadelphia “97.5 The Fanatic” sports talker Tony Bruno is scheduled to begin making weekly appearances on Keith Olbermann’s ESPN 2 program. The first appearance will be tonight (2/14) live from ESPN’s Times Square studios in New York City…..Cumulus Media’s KOH, Reno is holding a radiothon today at the Atlantis Casino Resort Spa to benefit the Veterans Guest House which provides temporary housing for vets and their families while they are being treated at the Reno VA. This is the 11th annual radiothon the station has produced for the cause…..CRN Digital Talk Radio announces the winners of its first annual Food & Wine Awards. CRN Digital Talk Radio is celebrating its 30th anniversary this year and is home to several food and beverage-oriented programs. It asked listeners to decide 2013’s Best Chef, Restaurant, Sommelier, and Winemaker. President and CEO Mike Horn says, “Food and wine are best enjoyed with good company. Our listeners deciding the year’s best of the best in the culinary and beverage arenas was very much akin to sitting down, honoring some great people, enjoying a fun meal.” This year’s winners are: Best Chef of the Year – Andrew Sutton – Napa Rose, Anaheim; Best Restaurant of the Year – Gary Danko – San Francisco; Best Sommelier of the Year – Paul Coker – St. Regis, Monarch Beach; and Winemaker of the Year Jeff Stewart – Hartford Family Wines…..Broadcasts of New York Yankees baseball on new flagship sports talk WFAN-AM/FM, New York will debut with the February 27 exhibition game versus the Pittsburgh Pirates. Yankees games moved from CBS RADIO‘s all-news WCBS after a new contract was negotiated in the fall. Wichita Police Make Arrest in Case of Slain Radio Station Staffer. Police in Wichita have a suspect in custody in the early Monday morning slaying of Steckline Communications employee Daniel Flores. Authorities say that in responding to a Crime Stoppers tip, they pulled over Antwon Banks who proceeded to stab himself in the stomach. He’s in a local hospital under police guard and will be booked on felony murder charges when he’s recovered. He was apparently the ex-boyfriend of Steckline office manager Lisa Bryce, leading authorities to conclude that Flores was simply in the wrong place at the wrong time. Clear Channel Commits to Campaign for ‘American Heart Month.’ For the purpose of educating the public about heart disease, its risks and preventative measures, Clear Channel Media and Entertainment is committing more than $1 million worth of on-air media to that end. Today (2/14), Clear Channel is kicking off a two-week public service announcement campaign across its 840 radio stations to educate listeners on the symptoms of heart disease and stroke in honor of American Heart Month. Certain Clear Channel stations will air a comedic yet informative public service announcement voiced by Emmy-nominated actress Elizabeth Banks that highlights the signs of heart attack in women, while all other Clear Channel radio stations will air a second PSA, created by the Ad Council and the American Heart Association, to help people recognize and respond to the sudden warning signs of a stroke. TALKERS Weekly Affiliate Roundup. New station affiliations for Cumulus Media Networks programming this week include: for Michael Savage – WTAR, Norfolk; KMPT, Missoula, Montana; WQSI, Tuskegee, Alabama; and WWBA, Tampa; Phil Valentine – WCOA, Pensacola; Mark Levin – WGKA, Atlanta; KMPT, Missoula, Montana; and WVOC-FM, Columbia, South Carolina…..The Genesis Communications Network-syndicated “Freedom Feens” with Michael W. Dean and Neema Vedadi is added to the program schedule at KNOX-AM/FM, Grand Forks. 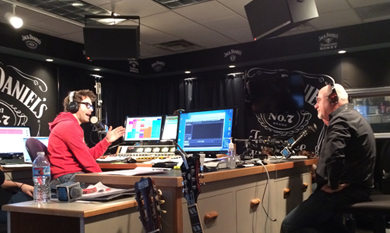 Dave Ramsey Counsels Bobby Bones’ Staff and Listeners. Nationally syndicated financial talk superstar Dave Ramsey (right) sits in on the Premiere Networks-syndicated Bobby Bones show based at WSIX-FM, Nashville, right down the road from Ramsey’s home base of Brentwood. Ramsey appeared with Bones (left) after Bones show producer Ray lost his truck in a Super Bowl bet and is some $8,000 in debt. Ramsey talked to the crew and audience about various topics including the terrible odds of gambling, tax withholding, and even the psychology behind using the debt snowball to pay off debt. ObamaCare Criticism Tops Talkers TenTM. The most-talked-about story on news/talk radio for the week of February 10-14 was the scrutiny of the rollout and effects of the Affordable Care Act and the delay in the employer mandate, according to ongoing research from TALKERS. Coming in at #2 on this week’s Talkers TenTM was the debt ceiling issue. At #3 was speculation about Hillary Clinton running for president in 2016 and at #4 was immigration reform. The Talkers TenTM is a weekly chart of the top stories and people discussed on news/talk radio during the week. It is published every Friday at Talkers.com. View this week’s entire chart here.